Announcement Welcome to The Red Pistachio, I hope you find something you love! Everything in my shop will be ready to ship within 3-7 business days (Monday - Friday) of receiving your order. I will notify you by e-mail when your order has been shipped. I will ship your order to the address you enter at check-out, please double check to ensure this is your correct mailing address. If you notice an error with your shipping address please contact me right away! **Please be aware: If you are purchasing a Pillow Cover the pillow form is NOT INCLUDED! Thank you! I am happy to help, please let me know if you have any questions! Q: Do you offer the blankets in any other sizes? Q: Which size fits a crib best? A: A standard crib blanket typically measures about 36 x 50 inches (a crib mattress measures approximately 27 x 52 inches in the US). I recommend checking your measurements to see what will work best for you! Q: Do the Pillow Covers include the pillow form? A: No, all of the Pillow Covers in my shop are the cover only. The pillow form is NOT INCLUDED. Pillow forms are available for purchase at your local craft/fabric stores. Q: What is on the back of the baby blankets? A: All of the blankets in my shop are backed with minky dimple dot. You can choose which color you prefer from the drop down menu. Q: I saw a blanket or pillow that I love and can't find it in your shop now? Can you help? A: Yes! If you don't see the specific item you are looking for, just send me a message! 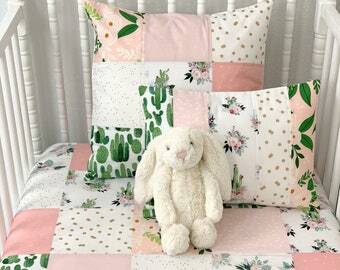 Q: Do you make coordinating crib skirts/crib bumpers/sheeting or window coverings? 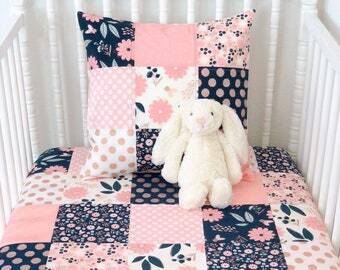 A: At this time, I am not offering any other crib bedding in my shop. Q: What is your current production time? A: My production time is currently 3-7 business days (Monday - Friday). Once your order is ready to ship I will send you an e-mail with your shipping information. Q: Do you sell the Bunting Flags I see in some of your pictures? Welcome to The Red Pistachio, I hope you find something you love! The colors turned out to be much more coral than blush & the blanket is also about 4 inches too short for the length of the crib. Loved the blanket!!! Fast service, great shipping time. This blanket is great! Super soft pink underside! I’m going to have it monogrammed for the perfect shower gift in a woodland themed nursery.I added the baby’s name and arrow at a local place. 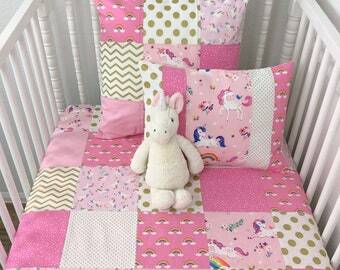 What little girl doesn’t love unicorns and rainbows? I just added this adorable new collection to my shop! New to my shop! How pretty are these colors? The green, gray and blue together are so soothing. And I just love all of the sweet little animals! Hello! Welcome to The Red Pistachio. My name is Cherie Godbey and I started my business in 2009. I live in beautiful Fort Collins, Colorado with my loving husband and our 2 wonderful children. Everything is lovingly handmade in my smoke free home. I want you to be happy with your purchase! If you are not pleased with your purchase, please contact me within 5 days of receiving your order to arrange for return and refund (minus shipping). Customer is responsible for cost of return shipping. Item must be in new (unused, unwashed) condition. No refunds or exchanges will be issued after 30 days of receiving your order. At this time I accept direct payment through Etsy and Paypal. Please note that PayPal accepts Visa, MasterCard, American Express, Discover and E-Checks. All handmade items will be ready to ship within 3-7 business days (Monday - Friday) of receiving notification of payment. I will send you an e-mail to notify you when your order has shipped. **PLEASE DOUBLE CHECK YOUR MAILING ADDRESS. If you notice an error with your shipping address please contact me right away. I can not be responsible for lost packages if you provide me with the incorrect address. Thank you! **UK BUYERS - This purchase is subject to VAT at 20% of the purchase price and shipping cost, plus an additional £8 surcharge. You will likely be required to pay this to collect your order from the Royal Mail. **International Shipping - Orders shipped out of the US may be subject to an additional tax/fee to be paid by you to your post office or customs office. Please be aware that I do not pay any duties, custom fees, or any other associated fees. These fees are the responsibility of the customer. Please educate yourself on your country's customs information including any fees that may be incurred on your end before purchasing. This information can be found at your local post office or on the web. Please be aware that shipping outside of the US can take up to 8 weeks to receive. Please take this into consideration before placing your order. Thank you! **Domestic Orders - Orders shipped within the US will be shipped USPS 1st Class or Priority Mail. Once your order is shipped it is the responsibility of the USPS to deliver your package in a timely manner. I appreciate your feedback and referrals! Thank you for your continued support! All of my items are machine wash cold, gentle cycle, tumble dry low. Do you take custom color orders? If you don't see what you are looking for just send me a message. Do you offer the blankets in any other sizes? Do the Pillow Covers include the pillow form? No, all of the Pillow Covers in my shop are for the cover only. The pillow form is NOT INCLUDED. Pillow forms are available for purchase at your local craft/fabric stores. 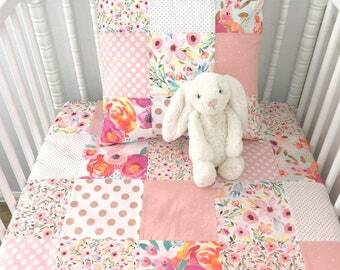 Do you make coordinating crib skirts/crib bumpers/sheeting or window coverings? At this time, I am not offering any other crib bedding in my shop. My production time is currently 3-5 business days (Monday - Friday). Once your order is ready to ship I will send you an e-mail with your shipping information. Do you sell the Bunting Flags I see in some of your pictures? What is on the back of the baby blankets? All of the blankets in my shop are backed with a minky dimple dot. Which size fits a crib best? 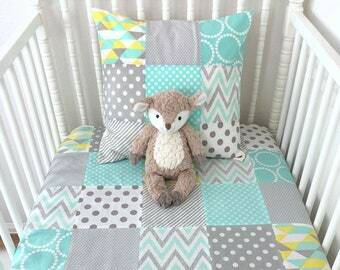 A standard crib blanket typically measures about 36 x 50 inches. 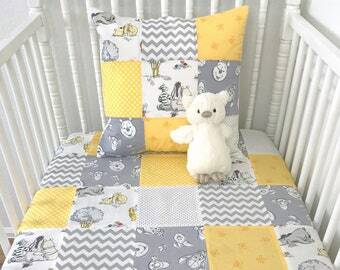 The 30 x 36 inch blanket will not fit a crib, most customers hang them on the crib railing. 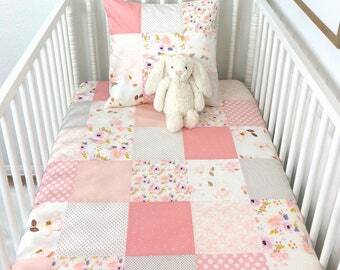 The 36 x 42 inch blanket will fit the width of the crib, but will not be the whole length of the crib. The 36 x 50 inch will fit a crib best. I recommend checking your measurements to see what will work best for you!